Even as a child, art has always heavily influenced Shar, creator of Punky Aloha Studio. The Kailua native brings her fine art and illustration background to lei palm, crediting the vibrant color palette of the islands for shaping her visual language. Inspired by the mid-century to the modern, Punky Aloha designs are bold, vibrant, and ever-adapting. In sum, the perfect balance of retro aesthetics with pop art. “Create where you belong” is Suzanne’s motto. And the Honolulu-based artist truly belongs in the islands. In previous lives, Suzanne lived in Hamburg, New York, São Paulo, Rio de Janeiro, and Los Angeles. Now, she finds inspiration in everyday life in Hawai’i: the beach, flowers, and of course, pineapples. “I hope my art brings happiness to others,” Suzanne says. One thing is certain: her beautiful, bright designs make it hard not to smile. Inspired by the organic lines and textures found in the islands, Leanna aims to connect people deeper to nature (and themselves) through her work. The Kailua artist is excited to bring her vibrant background in architecture and sustainable design to her stunning collection at lei palm. “It is the perfect embodiment of my water-based work,” Leanna says. And lei couldn’t agree more. 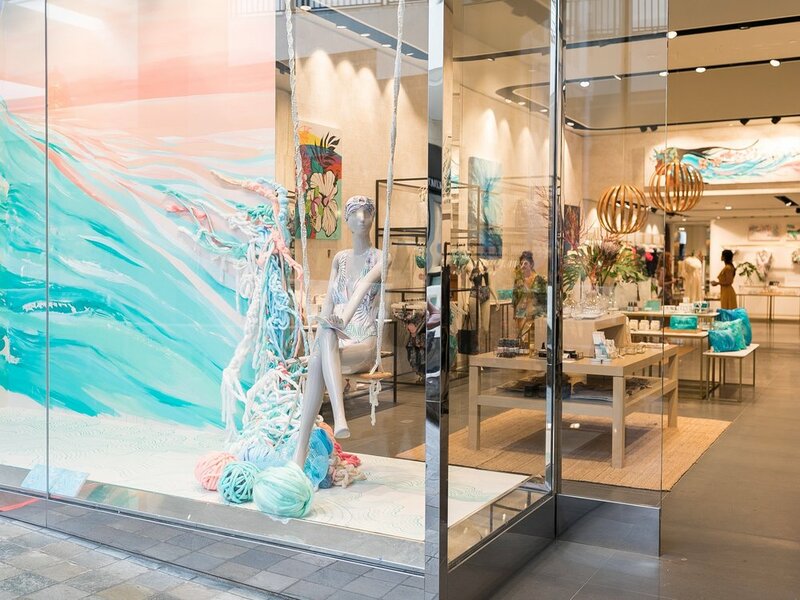 lei palm is a tropicallY inspired collection of CLOTHING, ACCESSORIES, GIFTS AND MORE CURATED IN hawaii using exclusive prints from local artists. shop our first colleCTION in store at ala moana center… online STORE COMING SOON!